I’d like to share with you a mysterious internal secret kept within Microsoft and the W3C for now a long time now. It’s the real story behind the concept of the CSS Grid Layout imagined by Microsoft for IE10 and Windows Store Apps. Most of you probably think that this specification was designed to help developers having a better layout engine for their websites and applications. But the original motivation was completely different. 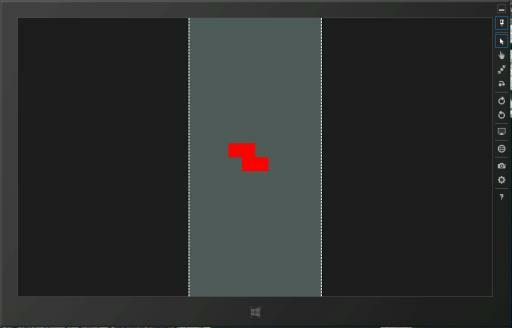 The very first aim was to be able to create a Tetris-like game in an easy way! But I’m sure you’re not convinced yet. That’s why, I’m going to prove it to you using Blend 5 as a companion. Ok, let’s go! Note: this is the director uncut version of my ParisWeb 2013 lightning talk you may watch here: http://new.livestream.com/accounts/1764940/parisweb/videos/31984601 if you understand French. 2 – Download & install the free edition of Visual Studio 2012/2013 Express RTM for Windows 8/8.1: http://msdn.microsoft.com/en-US/windows/apps/br229516.aspx that includes Expression Blend 5 for Visual Studio or use the higher versions. The shape1 is currently spanning on 3 columns and on 2 rows. I’m then creating a new grid inside this area defined by 3 columns and 2 rows in order to have cells having exactly the same size as the cells of the main grid, whatever the resolution will be! Even better, play with the various views available in the Device tab and you’ll see that our game is already implementing a responsive design! This is freaking cool, isn’t it? Let’s now resolve another problem. The Tetris grid gaming grid is composed of squares. Our current responsive design is stretching 100% width. Building a Windows 8 application for the Windows Store will most of the time meet widescreen monitors (current tablets are 1366×768 or 1920×1080 and most desktop PC have a 16/9 ratio). Let’s then assume that targeting a widescreen ratio is addressing almost all cases. To compute the proper responsive width, you need to do: 9/16 * 10/20 (the ratio of the main gaming grid) which equals to: 28.125%. Let’s now center the gaming grid by using… the CSS Grid Layout again! (And you should now start to believe it really was really designed for Tetris!). At this stage, you’re probably already shocked. “How could I have missed this incredible secret?” you’re wondering to yourself. Take a breath. Now that you now THE secret, let’s continue this tutorial together to discover other awesome possibilities delivered by the CSS specifications combined together. I then started to think about how I will rotate the shape. CSS Transforms seemed to be perfectly adapted for that. Let’s check that by doing some experiments. Blend 5 is really cool for that as you can directly see in live the outcome of your changes. And now, removing/adding the .shape1rotated class on the shape1 DIV will trigger a smooth rotation animation! You probably forgot that we’re currently moving a DIV element displaying a grid layout of 3 columns and 2 rows matching exactly the underlying gaming grid. When moving it, we really have the feeling that this is a block part of the main grid we’re moving. But for this tricks to work, we need at least 3 columns available to contain our shape element. If it’s contained in 2 columns (when set to the 9th column) or less, it will be “compressed” like in the screenshot. There is 2 ways to resolve that. 1 – Stop using CSS Transforms and draw the rotated shape using another grid definition. For instance, using 3 div inside the shape instead of 2. But using such an approach will prevent us to have the nice CSS Animations in place. 2 – Redefined the main grid to work on 12 columns instead of 10 and we’ll use only the columns from 2 to 11 (a sort of clipping area if you wish). This will resolve our “overflow” problem. Let’s implement the 2nd solution. It will help to delimitate the gaming area with a grey background and some dashed border lines. As the ratio need to be computed as = 16/9 * 12/20 = 106,66%. 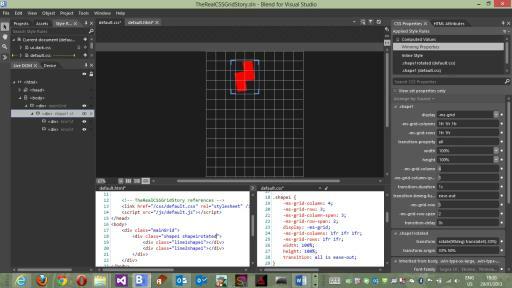 Open the “TheRealCSSGridStory” in Visual Studio 2012. Simply read the code to understand what it’s doing. It should be commented enough to be self-explicit. And we’re done! We now have a very basic game using CSS Grid Layout coupled with CSS Transforms & Animations for the graphics part and a couple of JS lines of code to have the beginning of the basics of a Tetris-like game. So, are you now convinced that CSS Grid Layout was made to simplify the creation of Tetris-like games?